May, and nearly halfway through the year. The Sun isn’t setting till nearly nine o’clock and it’s close to ten before we can see stars. Actually, the very first object that becomes visible is a planet; indeed, the largest planet, Jupiter. Look south as soon as the sky starts to darken and it will be obvious. It’s quite amazing that this giant ball of (mostly) gas is five times further away than the Sun. As the sky gets darker (and your eyes adjust to the lower light levels), the brighter stars appear. Just above and to the right of Jupiter you might see Regulus, the brightest star in Leo. Further to the right, Procyon should be visible and perhaps, above it, Pollux – although its companion in Gemini, Castor, might take a little longer. A similar distance to the left of Jupiter is the brightest star in the sky at the moment, Arcturus, in the constellation of Bootes. Below this is Spica, sitting in the Zodiacal constellation of Virgo. As the sky gets darker still, you should be able to make out a “Y” of stars pointing away from Spica, up towards Leo, where we started our look around the sky. This is the top half of the goddess of purity and innocence. By now it should be dark enough to look out for meteors, with the peak of the Eta Aquirid shower on the 5th. It may be a little late for sky watching for people for whom this is a school night, so try looking for the Moon as soon as the Sun has gone on the 7th. It will be a very thin sliver indeed as it is just one day old and only visible very low in the west for about half an hour after sunset. The 13th is a special day because the Moon waltzes around Jupiter over the next 24 hours. The most exciting day of all, especially for astronomers, is the 9th, because this is the day that Mercury passes in front of the Sun. This will no doubt be announced in the press as the “Transit of Mercury” but you heard it here first. Now, you cannot look at the Sun, especially with any optical instrument, as you will damage your eyes. The only way to see it is to project an image of the Sun with a telescope or binoculars. You could try the pinhole camera method, as suggested for last year’s eclipse, but Mercury is so tiny it may be tricky to spot. With a telescope, remember never to look through it, and to cap any finderscope it may have. Binoculars need a fixed support and one lens covered. 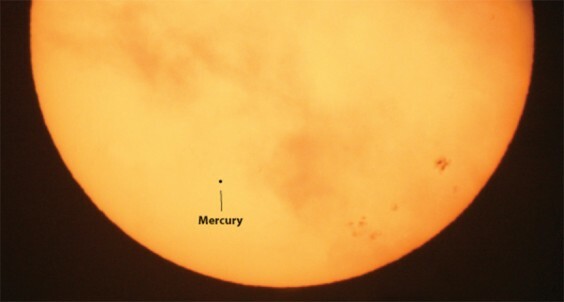 On the day itself, Mercury starts to cross the Sun at about 12.15 and the transit lasts till just after 19.30, so there’s plenty of time to get a patch of clear weather and you will get a chance to see it – even though it’s a pesky school day.